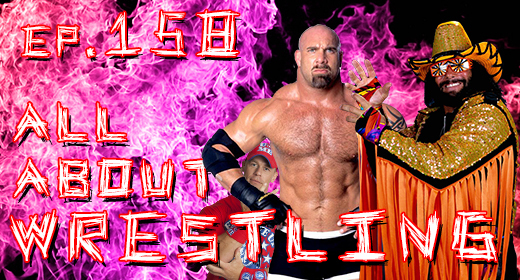 You’ve all voiced your geeky opinions for quite a while, and we listened; this week’s episode is all about wrestling! So for Episode 158, the Geeks tackle the most requested topic for this week’s show, but not without a little help. Our good friend Eric Plunk returns to the show, and bringing with him a formidable tag-team partner in Jeremy Hudson. To start the show, the Geeks enter the match on the heels of a swere, where #TweetTheGeeks is in reverse! We asked our guests this week’s question of the week, and gave our own geeky answers, but now it’s your turn! So, LET’S HEAR FROM YOU! This week’s question: If you could pick your own wrestler introduction theme music, what would it be and why? The first half of the show is dedicated to our guests, as they talk about some of their greatest wrestling memories, and talk about the early days of wrestling. If you’re a wrestling fan, you won’t want to miss this conversation. I’m sure you may be saying to yourself, “Well, words on the screen, what if I don’t like wrestling?” Ah! Great question! This episode is STILL for you! Everything you need to know, and might have always wondered about sports entertainment, is right here for you! Have you seen our YouTube awesomeness? Why not! Go subscribe to our YouTube channel today! After the break, Eric and Jeremy discuss where they think the future of wrestling, not just the WWE, is heading! Don’t miss it! Also, this episode is sponsored by lynda.com! With over 3,000 on-demand video courses to help you strengthen your business, technology, and creative skills, lynda.com has the amazing resources to help you unlock your inner geek! Visit lynda.com/justusgeeks today, and sign up for your free 10 day trial! Jeremy Weathers liked this on Facebook. @RMAJAMA25 @JustUsGeeks @The_J__Hudson Gotta love Handsome Jimmy Valiant. @EricPlunk @JustUsGeeks @The_J__Hudson oh yeah!! Handsome Jimmy….the boy from New York City! !